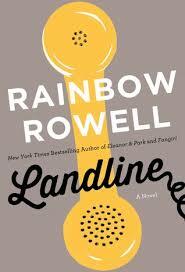 I recently finished the book "Landline" by Rainbow Rowell- bestselling author of Eleanor & Park. I didn't quite enjoy Landline as much as I enjoyed Eleanor & Park, but I did like it. The main character of the story, Georgie McCool is a comedy script writer. She is married, and has two young daughters- Alice and Naomi (AKA Noomi). Her career is just about to take off, but her marriage is crashing. What should she do? This book can somehow fit into both science, and realistic fiction. Through the novel, we see a magic phone, but I won't spoil anything else for you! For the most part, it deals with dying love, and the birth of a career. The underlying theme is most definitely love. However, this isn't just a typical love story. Rowell's writing helps the reader dive into a world that they've never experienced before. They understand the pain, misery, and trauma that the characters are going through, and are as delighted by a character's successes as the character is. Another thing I enjoyed about Landline, was the lack of stereotypes. It wasn't the husband who was busy, but the mother. It wasn't the mom who stayed home, but the dad. Georgie's best friend wasn't a girl, but a boy. Georgie- was a girl who wanted to be a comedian! Rowell casually writes antonyms to "society", allowing us all to understand that the definition of 'normal', is different for everyone. The flashbacks to Georgie's college days were also interesting, as they showed a completely different side to the same character. They weren't over-shadowing, but they did fit into the story line as though they always belonged there. Its tiny things from this book that made me realize just how different it is from others. The book is engrossing, emotional, surprising, and reads at just the right speed. I'd recommend it to fans of Rowell, as well as anyone else interested in romance of Young Adult Novels. If you haven't tried a Rainbow Rowell book yet..... what are you waiting for? I haven't read Christie for a long time, but always enjoy her work. Have you read Dorothy Sayers Lord Peter Wimsey books? Those are even better, I think! No I haven't. My summer vacations start soon, so I'll be sure to try some out. Thanks for the recommendation!